In 2010, Sony Ericsson introduced a range of tiny Android handsets to a market that was used to giant beasts. I take a look back at the X10 Mini & X10 Mini Pro. Since the modern smartphone era began in the mid-2000s, phone manufacturers have decided we need bigger and bigger screens. Phones have quickly become too large to fit in the average person’s pocket, and ones with 5″ and larger screens have been dubbed phablets by the media. But while the likes of Samsung, HTC, Dell, and even Sony Ericsson were releasing giant slab devices, Sony Ericsson rocked the Android world by diving in to the other end too: the mini smart phone. Pre-2010, I was a firm Nokia user and lover of the Symbian OS, but despite offering great handsets with battery life modern users would die for, they were being left behind by the new boys on the market. Apple and Android had their feet firmly in the door and had been slamming it in the face of once giants Blackberry and Nokia for a few years. So when I was in the market for a new handset, I started looking further afield. iPhones didn’t appeal to me at the time – due to their high price and because I was determined to still have a physical keyboard. So I looked at Android handsets with real keyboards. I was instantly struck by the tiny Sony Ericsson X10 Mini and its keyboard-laden partner the X10 Mini Pro. Both feature a 2.5” QVGA screen, a 600 MHz ARM 11 processor, 256MB RAM, and 5 megapixel camera with video capabilities. The X10 Mini has a 900 mAh non-removable battery, while the X10 Mini Pro has a 930 mAh removable battery. While being very small, they are quite chubby devices, being thicker than your average phone. The X10 Mini Pro is slightly taller and thicker than the X10 Mini due to its built-in slide-out keyboard. They might be plastic devices, but the build quality of them is great. Even though the X10 Mini Pro has a slide out section, it doesn’t feel like it is going to break. The slider is strong and sturdy, clicking into place once opened and snapping tightly shut when not in use. The buttons feel great to touch, and its small stature mean you could easily reach all the sides of the phone and slide it out with one hand. The X10 Mini has nothing on the left side. The right has the volume rockers and camera button. The top has the power/lock button. The bottom has the Micro USB and headphone socket. On the back you have the camera, LED flash and the speaker. The X10 Mini Pro has the Micro USB charging socket on the left. The right has the volume rockers and camera button. The top has the power/lock button as well the headphone socket. The bottom has nothing on it. On the back you have the camera, LED flash and the speaker – although in slightly different place to the X10 Mini. The front of both handsets has three physical buttons, menu, sub menu and back buttons. Both feature the regular slew of Android goodies such as WiFi, Bluetooth, a-GPS, MicroSD slot, accelerometer, proximity sensor, 3.5mm earphone socket, and Micro-USB charging socket. For 2010, it was a reasonably good device considering it was a midrange market. I had no issues with it, and performance was perfectly acceptable. It was my first venture in the Android world, so I didn’t have to much to compare it too, but I found it buzzed around and kept up with what I needed it to do. The HTC Wildfire featuring a 528 MHz ARM 11 processor with 384 MB RAM. It had a 3.2” screen with 240 x 320 resolution but it did come with 2.1 and upgradeable to 2.2. Motorola Flipout featuring a 600 MHz Cortex A8 processor with 512 MB RAM. It had a 2.8” screen with 320 x 240 resolution and came with 2.1. Samsung Galaxy Apollo featuring a 667 MHz processor with 256 MB RAM. It had a 3.2” screen with 240 x 400 resolution and came with 2.1 and upgradeable to 2.2. All of these handsets offer a budget feel. You don’t expect top-end performance from those aimed or priced at the lower end of the market. However, I think the X10 Mini and X10 Mini Pro pips the others. They offer a unique point in a crowded market. 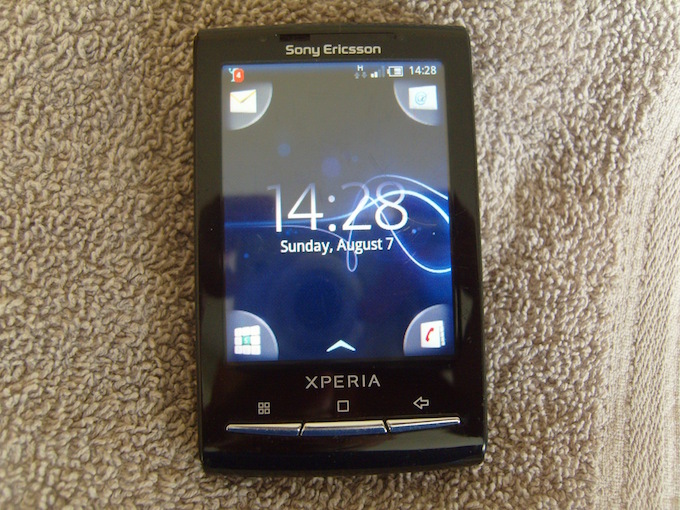 Due to the small screen, Sony Ericsson had to rework its UI to make it easier to use. The home screen features a four-corner hot spot approach. You can put an app or service in each corner for direct access. This make its easy to get to your most used apps. Once you open the app drawer you are faced with 9 apps per page, accessible via swiping. As a phone, it is great. It holds a good solid signal, and call quality is exceptional, with good clarity and volume. Other than that, everything on the phone is pretty standard: contacts, messaging, and music player all being good but nothing special. A small bonus I loved about it was the LED indicator – something I have missed since. It flashed different colours depending on what type of notification you get, great for quick glancing. I have seen this on other handsets, but they generally offer a single colour or two – whereas the X10 Mini and X10 Mini Pro could do many different colours. Syncing with a Mac is a piece of cake too. Just like most Androids, it is just a case of drag and drop to add and remove music, pictures, and videos via the USB mounted MicroSD card. It is a lot simpler than syncing an iPhone. For a budget handset, the X10 Mini range packs a decent camera. The 5 megapixel auto focus camera takes very good photos. Video recording was limited to 480p and a later update brought continuous auto focus. It didn’t feature a front camera – but very few did around that time. It wasn’t all good though. They were released with an already outdated Android version 1.6 Donut and it took over 12 months for Sony Ericsson to release the 2.1 Eclair update, by which time it was once again lagging behind, as most handsets were starting to get 2.2 Froyo. It took a huge online campaign by users for Sony Ericsson to finally issue an official upgrade to 2.3.3 Gingerbread to get the large X10, but unfortunately they didn’t give it to the smaller models, leaving them stranded at 2.1. The battery in both tiny handsets is very small – probably due to the size of the handset – and despite having only a small low resolution screen, the battery is seriously underpowered, giving it very poor battery life. It needs to be used very carefully to get it to last through the day on a single charge. It was my first venture in to modern touch screen smartphones. Looking back the 900mAh battery in this hardware actually performed quite well. It was the end of my ‘lasts for a week’ era of smartphones. From then on I would forever keep an eye on my battery life during the day. The screen only supports single touch, meaning you can’t use two fingers on the screen at once – i.e., pinch-to-zoom – which might not sound a big thing on a 2.5” screen. However, this isn’t strictly a hardware limitation, as some third party ROMs enable at least dual touch. The screen is quite small for input. The X10 Mini Pro has a slide out QWERTY keyboard, which is a very good keyboard – making writing very easy. The physical keyboard is one of the best I have experienced to type on. Because the keyboard pulls out from the side, changing screen orientation it gives it some extra room, and its domed buttons offer a very tactile feedback. However, the on-screen keyboard on both the X10 Mini and X10 Mini Pro is a standard T9 board, making typing anything more than a few words quite difficult. This is where the X10 Mini loses out. Of course third party keyboards could be installed – however, a horizontal QWERTY keyboard on such a tiny screen is very cramped. Despite the small screen, I found it quite easy to use for web browsing and Facebook, etc. I know a lot of people laughed at a modern smartphone only having a 2.5” screen, but I never had any problems doing what I needed on it. I would beg anyone to give it a fair try. And while the resolution isn’t awesome at only 240 x 320, the shrunken screen size helps keep it looking fairly crisp at 157 ppi. Keeping in mind it has the same resolution as some other devices rocking 3.5” displays, such as the HTC Wildfire, which only has 125 ppi. 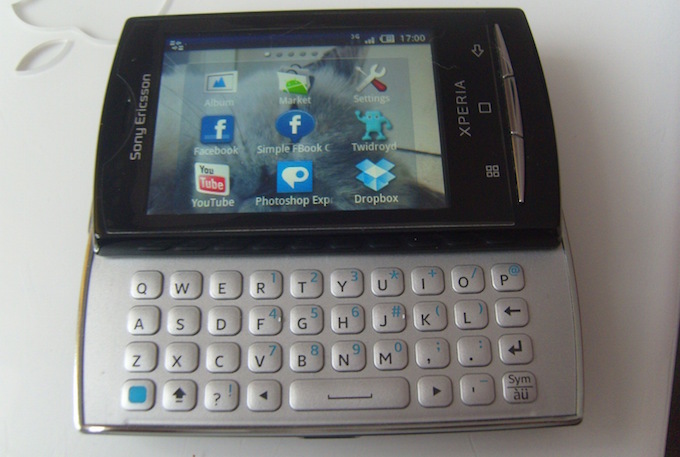 In 2011 Sony Ericsson updated their mini range with the Xperia Mini and Xperia Mini Pro – the latter once again featuring a slide out QWERTY keyboard. It was a considerable upgrade. It now featured a 3” screen with 320 x 480 resolution offering 192 ppi and using the Bravia engine. The processor was upped to a 1 GHz Snapdragon with 512 MB RAM. The camera is still a 5 megapixel camera capable of 720p HD video. The battery had been upped to a much better 1200 mAh and came with Android 2.3 Gingerbread and was offered an upgrade to Android 4.0 Ice Cream Sandwich. Fast forward a few years, and a 4″ screen is now classed as a mini handset. The Samsung S3 Mini, HTC One Mini, Sony Xperia Z1 Compact all smaller counterparts to their bigger siblings and all feature 4″ screens and upwards. If Apple were to ever offer the much rumoured (but not very likely) iPhone mini with a sub-3.5″ screen, I would be at the front of the queue. Perhaps it was the fact it was my first real smartphone. Perhaps it was because of its novel ‘talking point’ size, but I loved my X10 Mini Pro. It is one of the rare handsets that I actually bought a second one a year after selling mine. I then also bought an X10 Mini shortly after. I have a great fondness for these tiny beasts. What ever you do, don’t knock them without trying one. Give it a go for a few days. If you don’t fancy carrying a slab around with you, then these tiny little Android handsets are great. They might be a little dated now, but even today they are still charming little phones. You could alway install a custom ROM, such as CyanogenMod, to increase your Android version or to give it a near stock feel. I installed MiniCM6 and MiniCM7/MiniCM7 Pro, check out my YouTube videos. I have a real fondness for these tiny beasts. I’ve just won a Sony Ericsson X10 Mini which shall arrive shortly. I’m not sure what I am going to do with this little phone, but I am sure I will have some fun with it.